Octopused! A story in grainy pictures. I am typing with salt still encrusted to my face and hair. I really should warm up from my dive and wash off the NE Pacific before sharing this with you but this is the kind of story you want to shout from the seamount tops. However, be warned, there is a bit of a dark side to the story too. 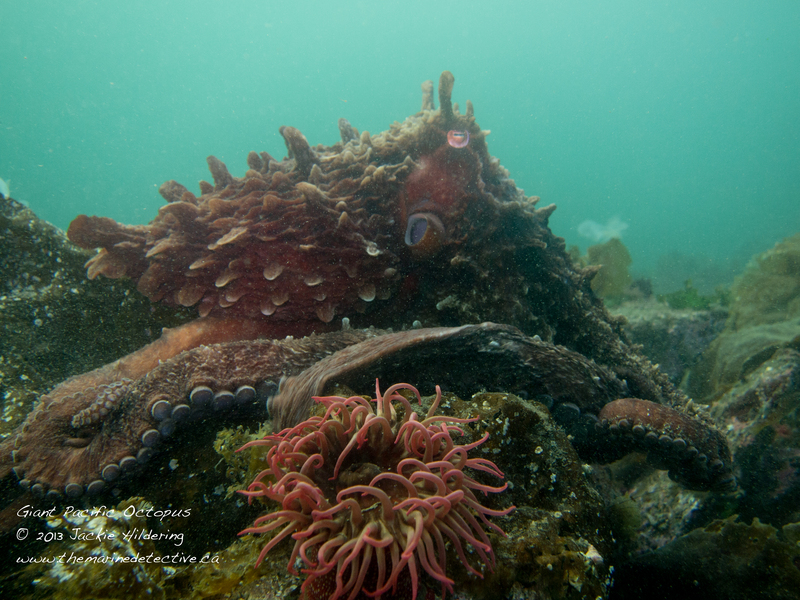 Today, while doing a shore dive in Port Hardy with the intention of surveying the health of sea stars*, I had the most wondrous experience I have ever had with not one, but two giant Pacific octopuses. 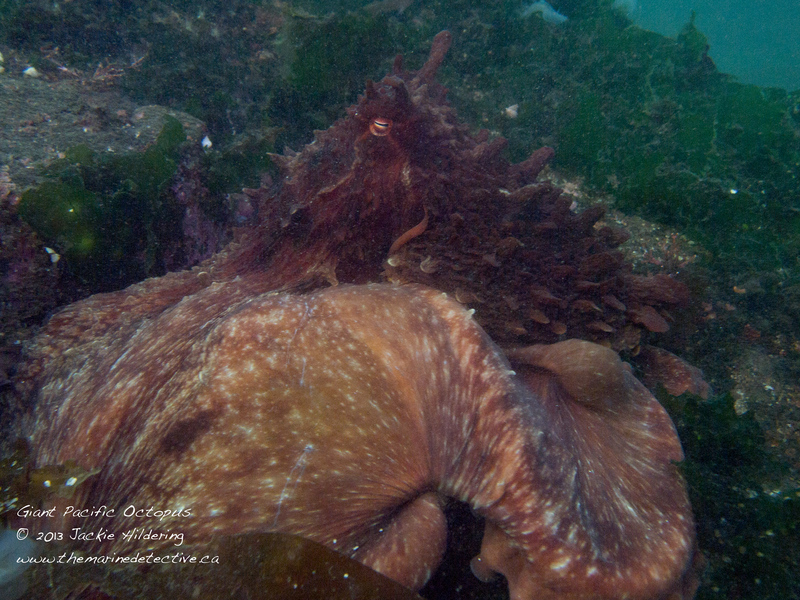 While photographing a sea star I must have disturbed the first octopus because when I looked down, wondering what had caused a massive disruption of hooded nudibranchs from the kelp, there she/he was in full glory – posturing to show me his/her impressive size, hooded nudibranchs undulating all around. 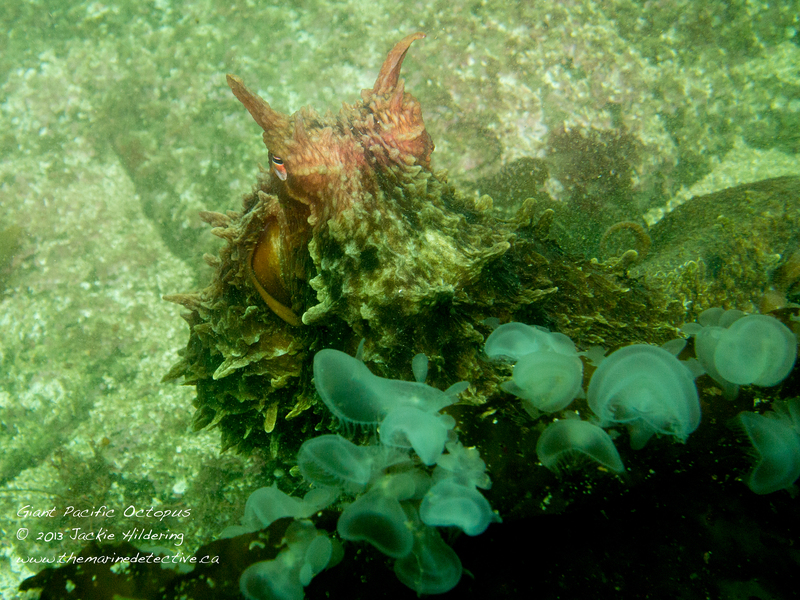 I even ended up with a hooded nudibranch stuck to my mask, which I gently shook off as I am a poor surrogate for kelp! After I recovered from the shock of this all and mumbled an apology in the guilt of triggering the chaos, I looked at the octopus for a bit . . . and she/he looked at me. 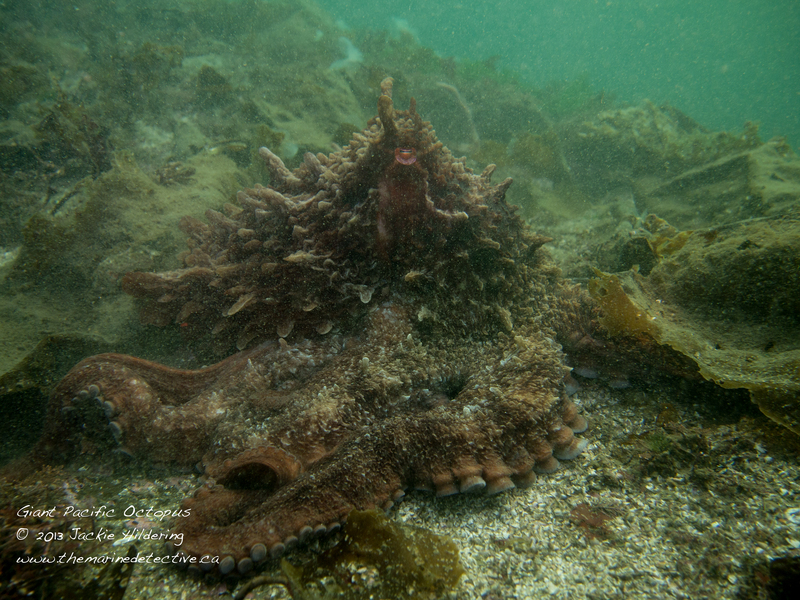 We both settled down, apparent in the case of the octopus in that he/she was no longer posturing and reverted to camouflage colours rather than alarm vibrance. After some minutes, the assessment appeared to be made by this sentient being that I was not a risk; and that there was no need to hide (nor ink!). As a result, for half an hour I was able to (respectfully) follow along as the octopus hunted. I was allowed to learn about hunting strategy and see how the colour and texture changed as it moved and how the mantle would flash white as it pounced upon prey. The only thing that stopped this deeply awe-inspiring experience was that dive buddy, Alex Spicer, found a second octopus in the open! 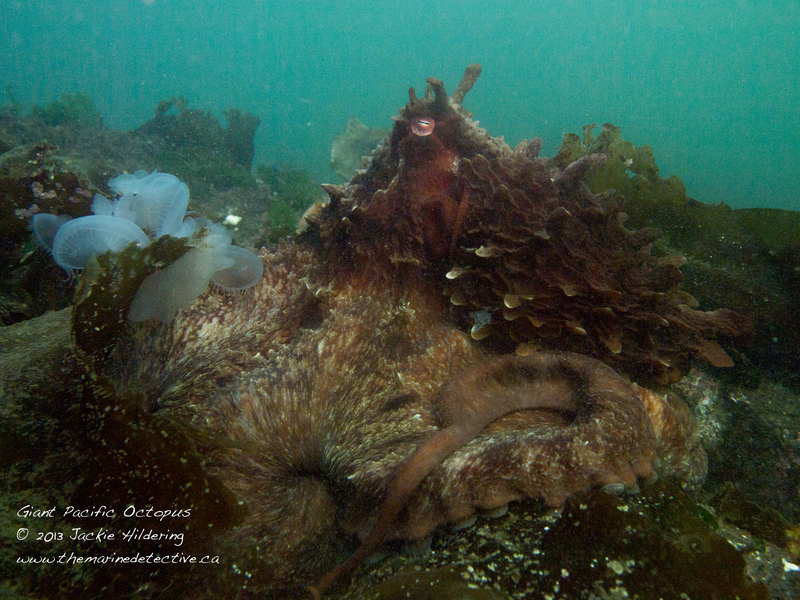 This much smaller octopus was using giant kelp like a hammock. The divers among you know what a rare gift it is to find one, let alone two, (unhabituated) octopuses out of their dens, certainly during daytime. The underwater photographers and videographers among you would be twitching all the more, knowing what an incredible opportunity this offers to capture the beauty of these giant wonders. Here’s the dark side. Thankfully it is a literal dark side. My strobes (flashes) didn’t work properly and it was my own doing. It’s been a crazy week of work and, in the flurry resulting from wanting to fit in a dive, I forgot the cables that hook the strobes to the camera. Yes, I was given what may be the opportunity of a lifetime but failed to fully capture the beauty of it, leaving you with only the grainy images below. However, I got to fully live the experience and had anything changed in the course of events that led to today’s dive, likely I wouldn’t have been octopused at all. I hope the images are still enough to illuminate the joy and wonder I felt. Your story is a beautiful one and I read it with wonder and awe. I also respect all the important work you do and feel you are such an asset to the wild and wondrous area that is called the Salish Sea and everything that lives in and around it. I have become so much more aware since reading your posts. Thank you. How exciting for you! And for us through your generous sharing. What does “unhabituated” mean in context of what you are telling us about these octopuses? 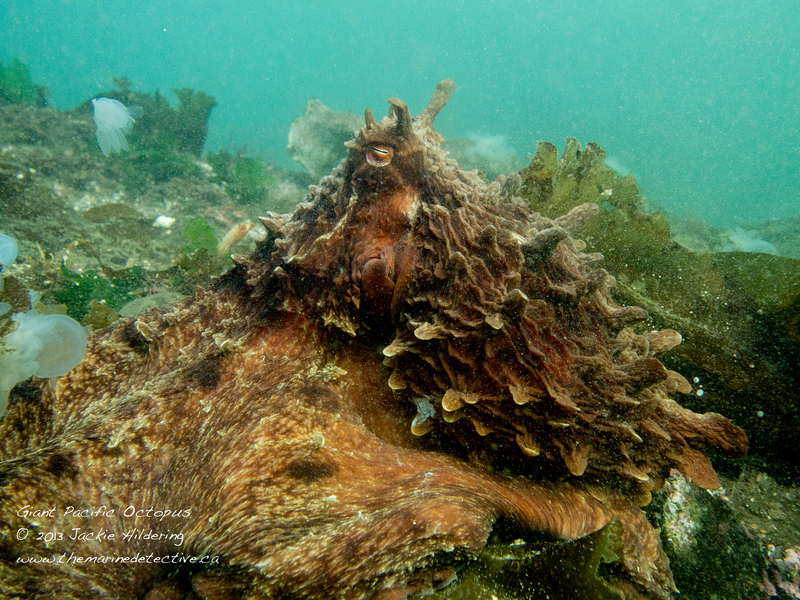 Are octopuses – territorial, seasonally territorial? @Good Jacqui – green filter of your own making? I’m really looking forward to your sea star post. It is my perception that the sunflower star is a major predator of sea urchins. I’m wondering how that will affect the kelp health next year in the areas where the mass mortality events occurred? An internet acquaintance from Rhode Island, U.S.A. recently posted that this is also happening off the East Coast. I haven’t come across any coverage of that in the news. Do/did you know about it happening on the east coast too? Hello Osmia and thank you so for the feedback. 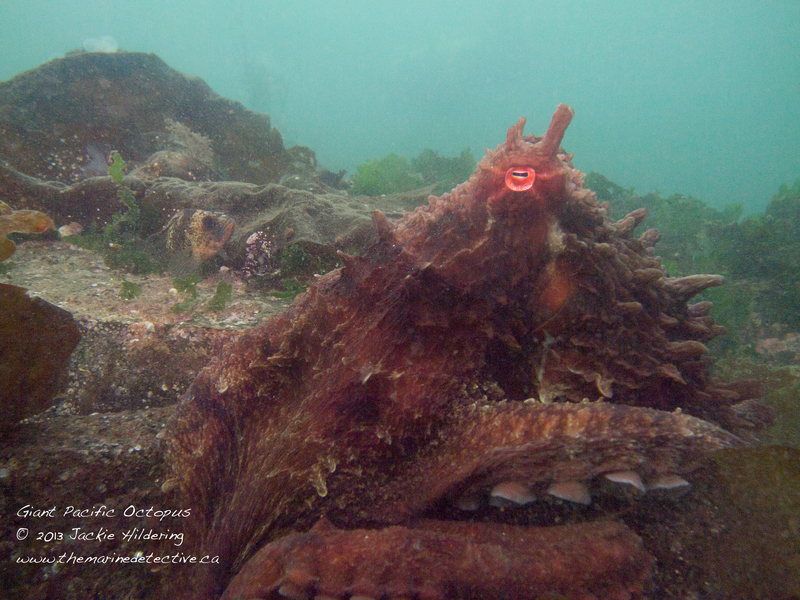 The “habituated” references that some divers choose to hand-feed octopuses at their dens whereby they lose their natural wariness. Indeed, I am aware of studies finding that Pycnopodia helianthoides is a significant predator of sea urchins on the west coast and indue, as top level predators, the loss of sea stars will certainly lead to shifts in marine communities. I will be sure to elaborate on this in my blog . . . if I can ever clear my paid work so that I can get to it! And my dear dive buddy Good Jacqui was referencing that she missed this dive due to a nasty cold. Not a pretty image is it? Awesome, and I’m not being colloquial! The experience you had and interpretation you shared interpretation are worthy of great awe. Your post sets two of my favorite organisms in the same space. I’ve loved hooded nudi’s since being first introduced two decades ago. 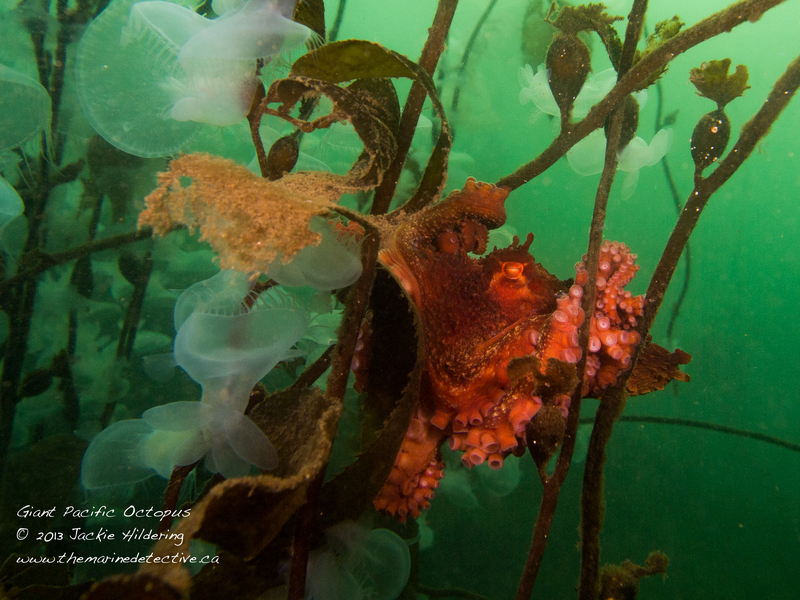 Melibe (hooded nudi genus) was one of our top two choices for a daughter ‘s name (seemingly we spawn only boys), and the giant pacific octopus is a defining invertebrate icon of the Salish Sea and beyond. Thanks for experiencing the Salish Sea and bringing us along! Amazing photos Jackie! Thank you. WOW what good luck to see two and great pics…thank you so much for sharing your experience with us!